Well.. today we decided to get crafty in the kitchen again, with our Valentine’s Whoopie Pie Love! What I hear your cry outraged, Valentine’s already?!?!?! Well… yes and no. Yes, because this is indeed title Valetine’s Whoopies, but no, because I believe you should be able to tell your loved ones at ANY TIME OF YEAR that you love them…. so we made our Whooie Pies with much love and then gave some to The Englishman and our lovely neighbours! So there. These are NOT JUST for Valentine’s! Oh and these are in fact Red Velvet Whoopie Pies, but I didn’t have enough food colouring to make them that delicious velvety red… so you have “simple heart shaped” whoopie pies… They are still yummy though! Also, I would like to link this to Toddler Approved! 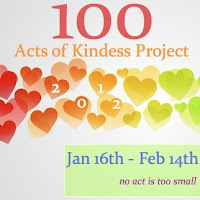 100 Days of Kindness that is launching next week. A project to get people thinking about others and doing small things for others as often as possible! Whenever we bake, we like to take some of it across the road to an elderly lady who lives on her own. We have been doing this for 2 years or so now and I confess to being VERY proud how willingly and with joy Red Ted runs over the road to bring her her treat! Sometimes he even suggests it before I have said anything. He really “gets it” and loves to share (so long as there is enough left for him too of course). What Act of Kindness would you do with YOUR child? Well.. it has to be a book on Love. Doesn’t it?! Here is a quirky one that you may enjoy – The Lovely Love Story, by Edward Monkton. Edward Monkton is “well known” in the UK for quirky little cards and stories found in gift shops. Usually, they are meant for adults as a little something and fun, but their innocents and simplicity of drawing is also lovely for children. This is a cute story about two dinosaurs that fall in love. I have even heard of people using it as a reading at weddings. Anyway.. the story roughly goes – there is a cold dinosaur who lives in a block of ice and then a lovely dinosaur comes along and with her kind words and loveliness melts the ice. They like each other. But are uncertain about one or two qualities and yet the overall love for each other means that they live happily ever after (despite the fact that one likes shopping too much and that the other can be a little distant at times..). Aaah. Love. A few weeks back, I was rather pleased to receive “Whoopie Pie Fun” to review. And you may have seen my review earlier in the week (check it out here). I decided to give it a go with Red Ted, as we hadn’t baked together in ages. The publishers have kindly allowed me to reproduce the recipe and instructions. 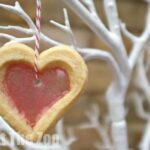 We tweaked it slighltly – mainly replacing the buttermilk and making ours Heart Shaped! 2. Perpare your milk if you are not using buttermilk – just add a little lemon and put to side (Red Ted really wanted a photo of this!). 3. Blend butter and sugar until soft and smooth. Add egg. 4. Combine cocoa powder, then food colouring and vanilla essence and add to mixture. 5. Gradually add flour & cornflour, alternating with a bit of milk. 6. In a small bowl combine vinegar and soda, then add to mixture. Blend for another 2min but not longer! 7. Using two tablespoons place “dollops of the mixture” on baking trays that have baking parchment on them (you will need 2 trays). Try and keep a space between the dollops – as much as your tray will allow! We ended with about 20-22 dollops, but the original recipe suggests either 18 or 48. We liked our mid size! I reckon 26 or would have been ideal. Bake for 8-10min. You can see how quickly they cook – the first batch is already setting as I inserted the 2nd in the photo above! Then do a taste test! 9. 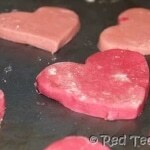 Use a heart cookie cutter to cut out hearts. (I hate waste, and having to small helpers really helps at this stage… all left overs where devoured). 1. Whisk milk and butter together. Place on medium heat on stove. Once it starts thickening remove from stove and let cool. 2. Beat together sugar, salt, butter/ margarine until soft and fluffy. 3. Add vanilla and milk and flour mixture. Beat for at least 3 minutes with an electric whisk. 4. Add to sandwhich with a knife or chill until ready to use. YUM YUM YUM! We left some “round”, but the majority was heart shaped! We ate them both the same day and the next! Delicious. Thank you, Whoopie Pie Fun, for letting us share the recipe! 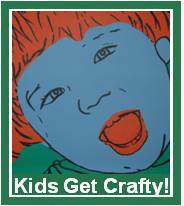 For more Kid’s Craft ideas, click here for a full list. So… fancy a go at making your own Red Velvet Valentine’s Whoopie Pies? 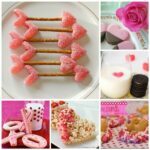 Have you got a Valentine’s Recipe to share? The cakes look tasty, but what I love is that helper of yours. He is so handsome! Thank you, our first attempt too and we really enjoyed them!! Ah good point! Next time I will put the US measures! Sorry!!! Fabulous! And enjoy the recipe! Those look delicious! Loving the cupcake wrappers too! YUM! I am definitely giving these a try in the coming weeks! We LOVe baking (& eating) sweet treats. We love whoopie pies! 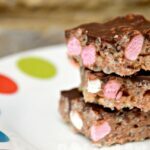 I recently found a filling recipe with marshmallow creme that is to die for! I\’m going to try red velvet heart whoopie pies this year for Valentine\’s Day. Oooh I bet marshallow creme is GOOD! 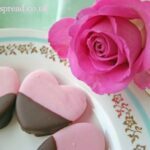 Your amazing…you only do you make whoopie pies but you make them heart shaped! They are fab and a perfect valentines treat! 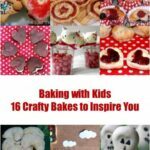 Thanks for linking up to Family Frolics – Hope you come back and look forward to reading more posts. Kerry – that kind of flattery will get you everywhere!!!!! Looking forward to more frolicking! These are darling! I came across your place from Homemaker Monday. I love the red color, but I hate to put all the coloring in there so I think I will be happy without. Loved it! These look like such tasty cakes! Those look so yummy! Can you send one my way? All gone I am afraid!!! We gobbled them up! Aaah thank you so much Isil!! i have never tried or made whoopee pies but always they look really nice. the red velvet cupcake recipe that i used is very similar to yours – i didn\’t have buttermilk so i used vanilla yogurt! Red Ted looks very at home in the kitchen helping you with the cooking – long may it continue ! Aaaah thanks Jenny! 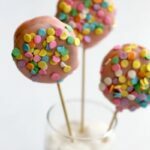 They are surprisingly easy to make and will definitely give them another go! And yes, Red Ted loves helping!! Especially if it is CAKE! Id never thought to do shaped whoopie pies! 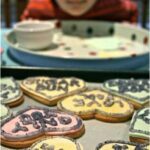 Always looking for ideas for using our cookie cutters! – we have lots! There is a bit of ahem “waste”… but I know some people who like to gobble that up!